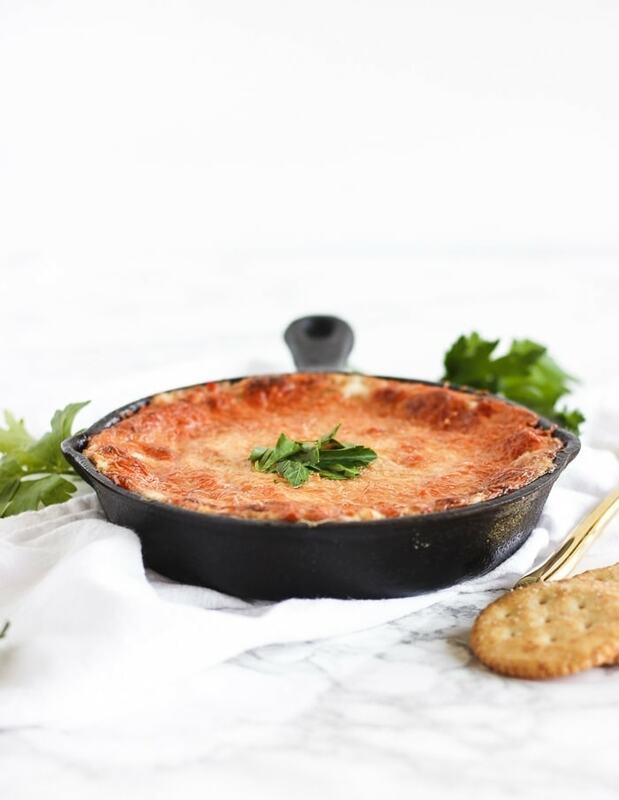 I don’t know about you, but my favorite appetizer to munch on during football parties and tailgates is a hot, cheesy, delicious dip! I mean, there’s really nothing better to snack on while watching men in tight pants run each other over for a ball, am I right? Since yummy dips tend to be quite addictive, I like to healthify mine (without sacrificing any flavor of course). I’ve already lightened up a couple delicious dips for snacking on, like my Healthy Hot Broccoli Dip and my Healthy Slow Cooker Green Chile Corn Dip. 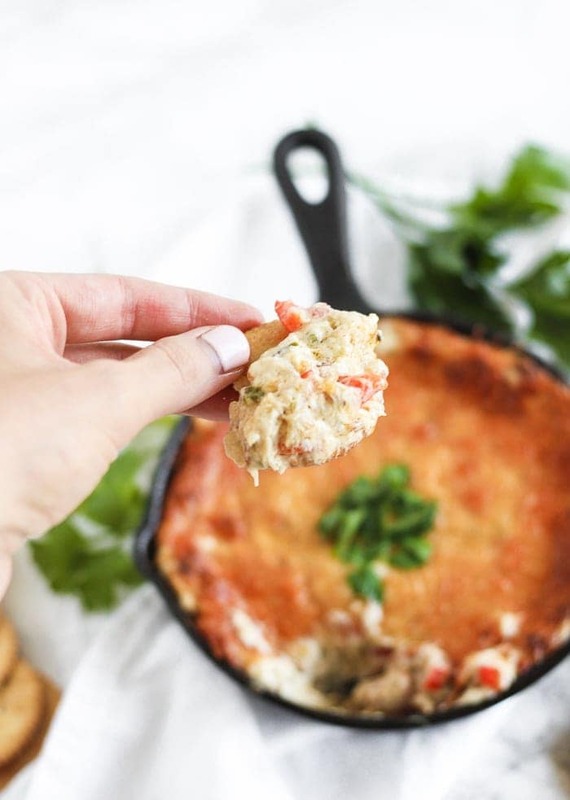 But I’ve decided to step up my dip game and bring you another delicious one for football season: Healthy Red Pepper Crab Dip! You guys. 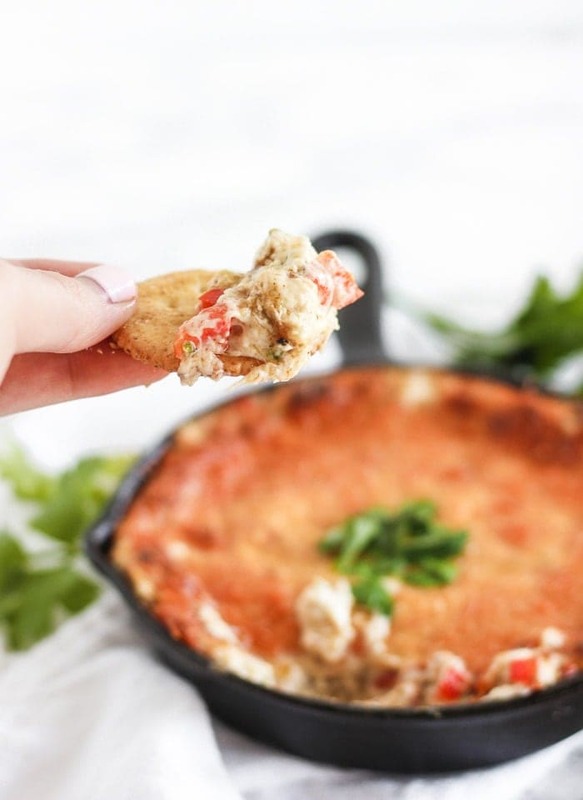 This Healthy Red Pepper Crab dip is AH-MA-ZING. It’s filled with jumbo lump crab, sweet red bell peppers, and of course lots of delicious cheesy goodness! And in the typical Lively Table way, it’s made healthier with nonfat Greek yogurt and reduced fat cream cheese, which give you a creamy, dreamy dip with way less fat (and more filling protein) than traditional versions. It’s also packed full of veggies and jumbo lump crab that will keep you full for hours. 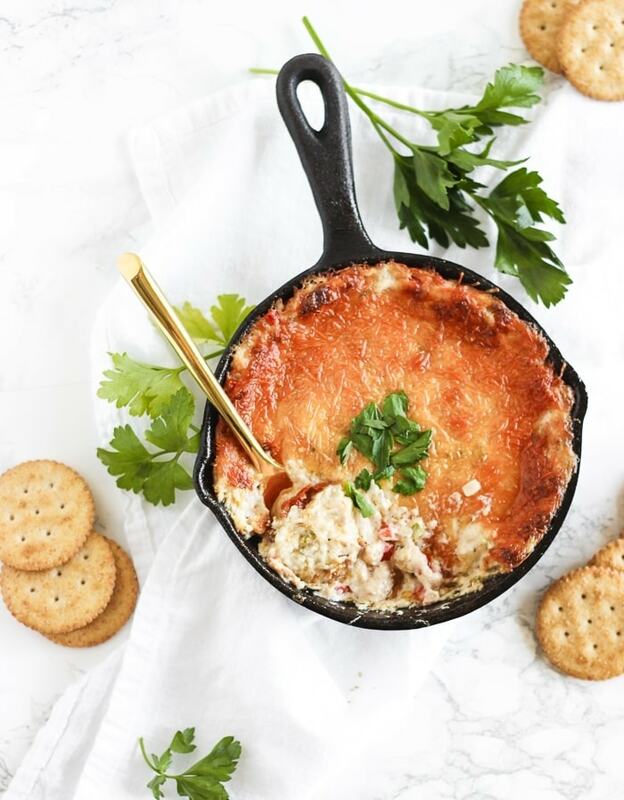 To make your game day snacking even healthier (and gorgeous), serve my healthy red pepper crab dip with a variety of fresh veggies, whole grain crackers, baked tortilla chips and pita chips. Your guests won’t even know this delicious dip is healthy, they’ll just think you are a superhero and you make some amazing football food. Can I get a TOUCHDOWN!? 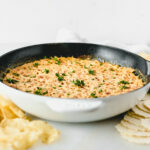 A hot, cheesy, healthier red pepper crab dip that’s perfect a perfect snack or appetizer for guests during football games, parties, or tailgating! In a large bowl, stir together cream cheese and yogurt until well combined. Stir in remaining ingredients, reserving 1/4 cup of the parmesan. Spoon mixture into a 8″ square or round baking dish. Smooth with the back of a spoon and sprinkle with reserved 1/4 cup of cheese. Bake for 30 minutes or until bubbly and the top is slightly golden. Serve hot with whole grain crackers, tortilla chips, or cut veggies. What’s your favorite football game snack?